Join PCGC as we fire the cannons for our annual Gator Day with the Bucs! 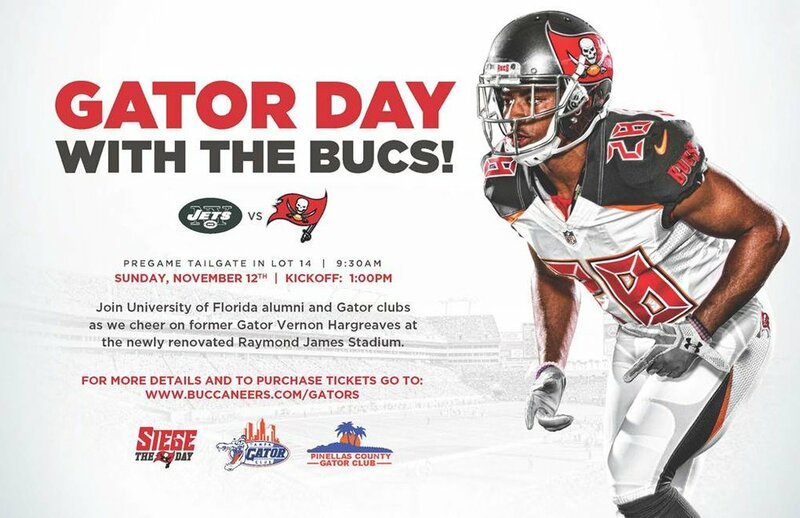 We have teamed up with the Bucs and Tampa Gator Club to give Gator fans an opportunity to cheer on former Gator cornerback, Vernon Hargreaves as the Buccaneers take on the New York Jets at the newly renovated Raymond James Stadium. Kickoff is at 1pm. Our pregame tailgate starts at 9:30am in Lot 14 with snacks provided by Thirsty First. Fans are also encouraged to bring additional tailgate supplies such as games, food and drinks, chairs and tents. There will be tons of Bucs gear raffled off during the tailgate, including items autographed by Vernon himself!